The great Dominican and Thomist, Father Garrigou-LaGrange, says this: “Therefore, to obtain this grace of final perseverance, we should frequently unite ourselves with the Eucharistic consecration, the essence of the sacrifice of the mass, pondering on the four ends of sacrifice: adoration, supplication, reparation and thanksgiving” (Providence, p.331). This is quite a beautiful and powerful recommendation. He also mentions the advice of Pope Benedict XV to have a mass said while you are living for the grace of a happy death. Make the effort – it will be well worth it! – to have a mass said for you and your spouse (or sibling, etc.) to die in sanctifying grace. “We may here remind the reader of the great promise of the Sacred Heart, to those who receive Communion well on nine successive First Fridays. This promise, we have said, is absolute, that it supposes that Communion has been well made for these nine times. 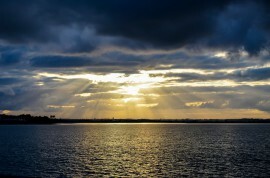 This would be, therefore, a grace given only to the elect” (Life Everlasting, p. 262). I encourage everyone to make (or complete) the First Friday devotion, and also to stay very close to the Blessed Virgin who has a “special office” to pray for us at the hour of our death, she who was given to us as a great gift by Jesus, from the Cross, as he died to give us eternal life. Finally, let us beseech Saint Joseph incessantly for the grace of a happy death, for he is the Patron Saint of a happy death. P.S. Father Garrigou-LaGrange once had a student named Karol Wojtyla…who was recently canonized! Pray to Saint John Paul II for the grace to make the First Friday devotion. 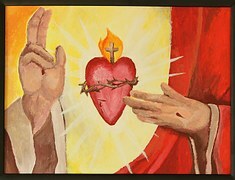 Notice, of course, the profound relationship between devotion to the Sacred Heart of Jesus and a profound love of the Holy Eucharist! Image: Stations of the Cross, Pasierbiec, Poland, using Saints and other heroic Catholics from Poland. 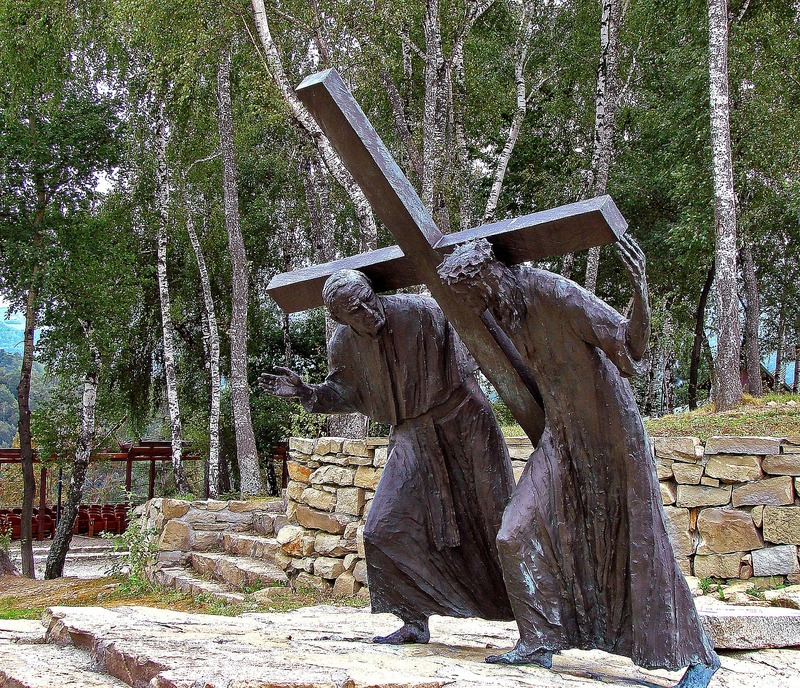 The Station in question thus substitutes Saint John Paul II in the place of Simon of Cyrene (fifth station). Picture used with permission. As to death, it is a great grace to realize that we are going to die. In essence, our lives are but a preparation for death. God, in His providence, already knows the day and moment of our death, and He has already put in place the graces we will need to be saved. We need to cooperate with those graces, and all will be well. Unfortunately, so many people live their lives without much thought about their impending death. They realize that other people die but they sort of see themselves as a bystander to the death of other people – somehow convincing themselves that it won’t happen to them. And although attending someone’s funeral may make such a person anxious about death, it is also the case that we are quite adept at putting in to place psychological defense mechanisms that quickly assuage such thoughts and turn our attention back to the world. As I see it, there is a gigantic cultural conspiracy in place to convince us that we are not going to die. The plan is to outlive death by taking the right vitamins, wearing the best make-up, and seeing the best doctors. And yet everyone still dies. We are all on an absolute collision course with death. Only God knows for sure how much time we have left. And the clock keeps ticking. I think it is interesting that in Mother Teresa‘s mystical life the Virgin Mary told her to tell families to say the rosary (reference: Come Be My Light, Doubleday, p.99). This prayer not only helps us to contemplate the life of Christ, including his death and resurrection, but it continually reminds us of the two most important moments in our lives – the present moment and the moment of our death. We ask Mary to “pray for us now and at the hour of our death.” It is in the “sacrament of the present moment” that we can choose to conform our will to God’s grace, and it is at the moment of death that we need all of Heaven (that great cloud of witnesses, Hebrews 12:1) interceding for us to persevere to the end. It is important to pray for the grace of final perseverance and for the fortitude to die a good death. It is reassuring to know that we are asking Mary’s help in this regard when we pray the rosary. Don’t put your trust in the passing things of this world (those idols have no power to save you). Be a little greedy for Heaven, and in the process transform that greed into love and gratitude for a God who, after dying for our sins and humbling himself to be our very eternal life-giving food, has prepared for us such an immense reward that the magnitude of the joy and love we will experience in Heaven is beyond our narrow understanding, lasting for endless ages, in the glory of the “ever-blessed” life of God. In short, to say that Heaven is going to be awesome is an incredible understatement. the tone and content of the note).